Recently, Patanjali, the initiative of the very popular Yog Guru Baba Ramdev has earned lots of popularity and recognition in the markets. The reasons for such a trend have been the herbal nature and Ayurvedic combination of these products. This article brings to the list of best herbal products offered by the promising Patanjali brand. Though these products are not very popular are they are not marketed like the contemporary cosmetics and medicines but they are amazingly effective in the results that they claim. Find out what all products have won the hearts of thousands of Indian with their amazing results in such a short time. All these products that have been mentioned below are marvelous with their results. These are mainly beauty, health and fitness products which have been very decently priced. Let us have a look at some of the best offerings from Patanjali which have become very popular in this short span. Patanjali Saundarya Face Wash is made with the natural extracts of various healthy herbs for skin. Neem, Tulsi, Aloe Vera and Orange peel are some of the ingredients in this natural face wash from Baba Ramdev’s brand. It nourishes and revives the skin and lightens the complexion. It claims to make the skin smooth and beautiful. It doesn’t contain any chemicals as it is purely natural. Patanjali Aloe Gel is one of the finest products from Baba Ramdev. It claims to be a natural product with mild preservatives and permitted colors. It contains Vitamin E. Natural aloe vera is the main ingredient of this amazing gel which claims to remove pigmented spots on the skin. It comes in a handy tube is very easy to use. It is a gel with a cool feel which nourishes the skin with the goodness of aloe vera, an amazing herb for hair and skin. It is an amazing soap from Patanjali. Ojas Mint Tulsi body cleanser is a 100% natural. It is a healthy combination for skin which claims to keep your skin healthy. It claims to be very effective in rejuvenating, nourishing and glorifying the skin. On regular usage, it promises in removing dryness and roughness of skin thereby making it softer and smoother. Patanjali Dant Kanti Dental Cream is anatural toothpaste which comes with an amazing combination of herbs like neem, vajradanti, cloves, babool and meswak which are considered the best for all kinds of tooth problems. It is very effective in providing relief from problems like toothache, bad breath, bleeding gums, gingivitis etc. It claims strong, white and healthy teeth. Patanjali Aloe Vera Juice comes with multiple health benefits. It is very effective in problems like arthritis, skin disorders, ulcers, constipation, cholesterol, acidity along with assisting weight loss and increasing immunity. Patanjali Tejus Coconut Oil is another natural herbal product from Baba Ramdev. It is made with fresh and mature coconuts. It is pure and non-RBD oil with the rich aroma of coconut. It doesn’t contain any preservatives and can be used for local application and cooking. It is 100% edible oil with no chemicals. It makes skin soft and hair nourished. Patanjali Divya Kesh Tel is a wonderful Ayurvedic medicine which claims to reduce hair fall. It also claims to prevent premature graying of hair. This herbal oil is also very effective in alopecia. It is prepared with the natural herbs and herbal ingredients that are beneficial for hair. It comes in a brown colored plastic bottle. It is a very effective product from Patanjali for reducing hair fall. Patanjali Neem Tulsi Face Wash is a soap free gentle face wash for all kinds of skins. It contains aloe vera, neem, honey and tulsi which are amazing herbs for healthy looking skin. It claims to kill germs on your skin thereby rejuvenating your skin. Get a lighter skin with a smooth and soft feel. It is also very helpful in preventing pimples on skin. Patanjali Kesh Kanti Hair Cleanser is a health care product from Patanjali which claims to reduce hair fall and breakage. It deeply nourishes the hair thereby making them softer and smoother. It also claims to reduce the dryness and enhance the growth of hair. It is a natural hair treatment which largely contains various herbs which are good for hair. It is decently priced and comes in a travel friendly packaging. 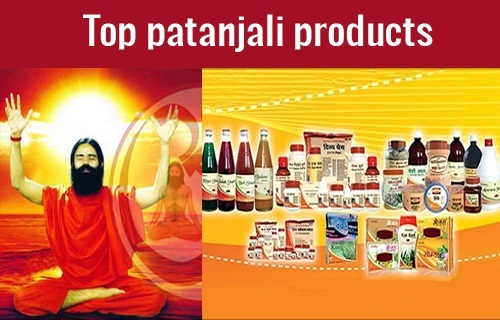 These are the best of the products from Patanjali which have delivered their promises to the fullest. All of these products are highly effective and natural in their composition. These reasonably priced products are worth a pick for their wonderful results.